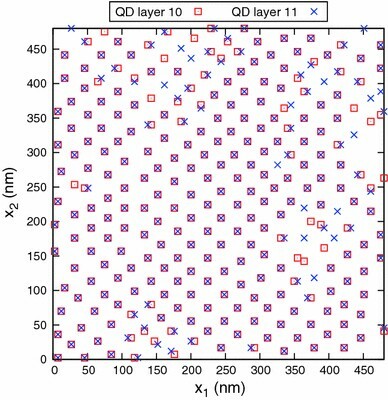 A model has been developed to simulate the growth of arrays consisting of a substrate on which alternating layers of quantum dots (QDs) and spacer layers are epitaxially grown. The substrate and spacer layers are modeled as an anisotropic elastic half-space, and the QDs are modeled as point inclusions buried within the half-space. In this model, the strain at the free surface of this half-space due to the buried point QDs is calculated, and a scalar measure of the strain at the surface is subsequently determined. New point QDs are placed on the surface where the previously calculated scalar strain measure is a minimum. Following available DFT results, this scalar strain measure is a weighted average of the in-plane strains. This model is constructed under the assumption that diffusional anisotropy can be neglected, and thus, the results are more in agreement with results from experiments of growth of SiGe QDs than experiments involving QDs of (In,Ga)As. Arrays of quantum dots (QDs) show promise in optoelectronic applications, such as semiconductor lasers [1, 2] and photodetectors . 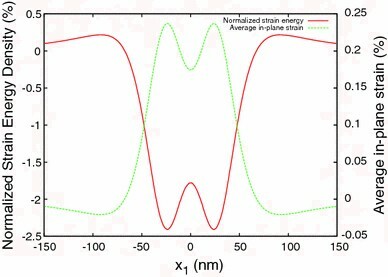 A layer of semiconductor QDs can be grown through Stranski-Krastanov (S-K) growth , where a wetting layer of one material, such as Ge or InAs, is epitaxially grown on top of a layer of another material with a different lattice constant, such as Si or GaAs. 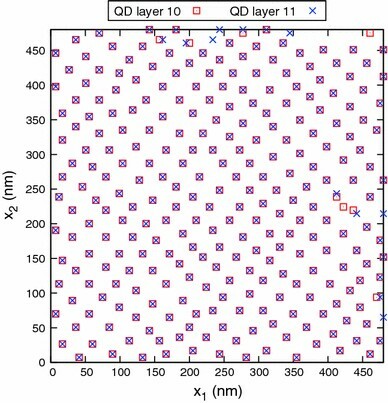 The strain from the lattice mismatch is partially relieved through the formation of three-dimensional mounds in the wetting layer, and these mounds can then be used as quantum dots. A three-dimensional array of QDs can be formed from multiple layers of QDs, as illustrated in Fig. 1. For example, InAs QDs can be formed from alternating thick layers of GaAs and thin layers of InAs, where S-K growth occurs in the thin layers . where T is the temperature, k B is the Boltzmann constant, is the energy barrier to diffusion, and i and j are the labels of the binding sites at the beginning and end of an adatom’s hop. E T(i, j) is the energy at the saddle point between the energy minima at sites i and j, and E i is the local energy minimum at site i. If the zero energy datum for E T (i, j) and E i is set appropriately, then E i is the binding or adsorption energy as well and is a measure of the reduction in total energy due to the adatom binding to the substrate [7, 8]. The reconstruction of semiconductor surfaces to minimize the number of dangling bonds  may cause different kinds of binding sites on the surface, e.g. one site may be between the two atoms of a surface dimer, while another is within a trench between two dimers . The energy barrier is influenced by, among other things, the strain field in the underlying substrate [7, 11]. According to ab initio simulations, for an isolated adatom on a (001) semiconductor surface, the dependence of on strain is roughly linear for small strains [7, 11–13]. In particular, the work of Shu et al. specifies the following dependence on strain. is a local minimum. The sign convention for strains here—and for the rest of this paper—is the usual one. Negative is compressive, and positive is tensile . Here, [γ ij (x)] is the strain tensor at point x at the surface of the QD array before a new wetting layer is deposited. The strain energy density U([γ ij ]) equals C ijkl γ ij γ kl , where C ijkl is the elasticity tensor, and the usual Einstein summation convention is used. is the lattice mismatch strain and equals δ ij (a QD − a matrix)/a matrix, where δ ij is the Kronecker delta, and a QD and a matrix are the lattice constants of the material of the QD (e.g. InAs) and the surrounding matrix (e.g. GaAs), respectively. The second term of the sum in Eq. 3 takes into account the strain due to wetting layer itself, which is the opposite of the lattice mismatch strain. This model, unlike that of Tersoff et al. , is not entirely deterministic, since the locations of the QDs in each layer are determined by randomly depositing adatoms onto a layer and letting them diffuse toward the nearest minima of ρ. Figure 2 shows a profile of ρ([γ ij (x)]) along a line in the -direction passing through x = (0, 0, 0) due to a InAs QD buried in GaAs at (0, 0, 50 nm) with an effective volume equal to the volume of a pyramid with 20 and 50 nm base length (same as the effective volume used in Ref. ). The figure also shows the corresponding profile of the average in-plane strain, (γ11 + γ22)/2, due to the same QD, and this profile looks nearly like an upside-down version of the profile of the normalized strain energy, which indicates that the model of Holý et al. in effect implies that the energy barrier to diffusion increases with increasing tensile strain. In this paper, we take an approach similar to that of Tersoff et al. and of Holý et al. , but seek to make the physical justification of our choice of SM(x) more clear and to explore the extent to which our approach can possibly reproduce experimental results. The connection between the diffusion barrier and SM(x) will be made explicit, and the drawbacks of using a scalar measure SM(x) to determine the locations of quantum dots will be discussed as well. 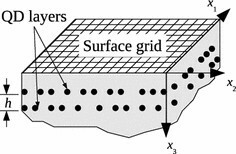 Figure 1 schematically shows layers of irregularly arranged point QDs separated by GaAs spacer layers of thickness h and covered by a GaAs capping layer, which is also of thickness h. An imaginary grid is shown superimposed on the surface, along with a set of coordinate axes. To determine the locations of the QDs that will be deposited on the surface of the capping layer, we calculate the strain γ kl (x) at each point x in the grid as follows. The tensor is the Green’s function for the stress in an anisotropic elastic half-space . is the misfit strain tensor, whose only nonzero elements are , and . For semiconductors with the zincblende crystal structure, these nonzero elements all have the same value, i.e. the misfit strain between the substrate and the QD. v a is the effective volume of the point QD. Accordingly, the effective radius of the QD is . The weighting factor α is taken to be a nonnegative fraction. The QDs are placed at grid points where SM(x) is the lowest local minimum. Once the new QDs are placed, the spacer thickness h is added to the x 3-coordinates of all the QDs, simulating the growth of a capping layer of GaAs with thickness h on top of the newly grown QDs. Then, we calculate SM(x) again to determine the locations of the QDs in the next layer, and so on. The physical justifications for our choice of SM(x) in Eq. 6 is as follows. We suppose that there exists a mean energy barrier, , and further, that this barrier has the same kind of dependence on strain as the energy barriers in Eq. 2. Atoms then are more likely to congregate where diffusion is slower, that is, where SM(x) is minimum, since SM(x) decreases as the energy barriers to diffusion increase. There are two key assumptions involved in the formulation of SM(x). The first assumption, of course, is that the energy barriers to diffusion generally decrease as γ11(x) and γ22(x) increase. The second assumption is that there is a mean barrier to diffusion to begin with. This is essentially the same as assuming that there is a single value that governs the escape of an adatom from its current binding site, an assumption that is violated, for example, if because of surface reconstruction, the barrier for an adatom to escape along the -direction is lower than that for an adatom to escape along the -direction. The latter assumption, however, is inherent in any formulation of SM(x), since such a formulation amounts to using a single scalar value as a proxy measure of the energy barrier to diffusion. The calculated strains at the surface of the GaAs half-space are at most on the order of 10−3 in magnitude, small enough for the approximate linear dependence of the diffusion barrier on strain to hold. Figure 4 shows the density of QDs as the number of layers in the QD array increases. For clarity, plots for only two spacer thicknesses, h = 24, 32 nm, are shown. The density of QDs in each layer initially increases rapidly as the number of layers increases, but then levels off. Larger spacer thicknesses lead to less dense arrays and a quicker leveling off of the density. Also, the density is not very sensitive to α, especially once it begins to plateau. 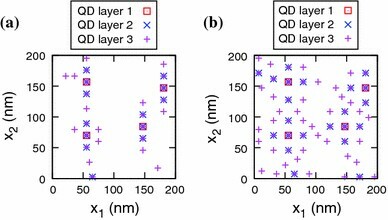 Figures 5 and 6 show the tenth and eleventh layers of QDs in arrays with spacer thickness h = 24 nm grown from the 10 × 10 initial layer shown in Fig. 3a. In order to more clearly see the lateral ordering of these QDs, only the first quadrant of the simulation domain, where x 1, x 2 ∈ [0, 480 nm], is shown. Surprisingly, the lateral ordering is not strongly affected by α. In both Fig. 5, where α = 0, and Fig. 6, where α = 0.5, the QDs are roughly aligned along lines at a 45° angle to the x 1-axis (or -direction), that is, aligned along the  and -directions. This ordering holds true even when the initial seed layer is changed from 10 × 10 to 10 × 20, as seen from Fig. 7. QDs in the next layer also tend to grow on top of QDs in previous layers. One can see this tendency of QDs to form vertical columns in Fig. 8, which shows cross-sectional views of the QDs in an array with spacer thickness h = 24 nm and α = 0.5. 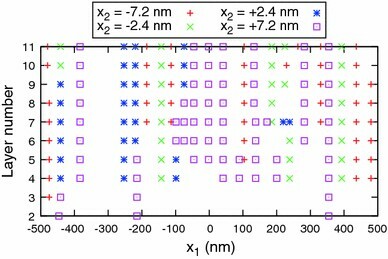 In this figure, QDs with x 2 ∈ [−10, 10 nm] are shown. The same trends can be seen for QD arrays of other thicknesses. The reasons why a similar lateral ordering occurs for different values of α can be seen from examining the first few layers of the simulated QD array. Figure 9 shows a close-up view of the positions of the QDs in layers 1, 2, and 3 of arrays with spacer thickness h = 14 nm, where the first layer is the 10 × 10 initial layer shown in Fig. 3a. For all values of α, the QDs in the second layer appear directly above the initial QDs. For α = 0.5, QDs also appear just to the sides of the aforementioned locations, both in the x 1- and x 2-directions. For α = 0, QDs appear just to the sides of the aforementioned locations as well, but only along the x 2-direction. In the third layer, for α = 0, QDs still preferentially appear along the x 2-direction, but when they do appear to the left or right (along the x 1-direction) of QDs in previous layers, they tend to appear such that their x 2-coordinates are approximately an average of the x 2-coordinates of the buried QDs just to their left or right. In spite of our choice of SM(x) being different from that of Holý et al. , our model produces the same lateral ordering of QDs as theirs does. We also obtain vertical columns of QDs as Tersoff et al. , Liu et al. , and Holý et al. , in spite of assuming that the diffusion barrier decreases rather than increases with increasingly tensile strain. This is attributable to the local strain minimum directly above the QD (of which one can see a cross section in the strain profile in Fig. 2), since QDs are placed at minima. This local minimum does not appear if isotropy is assumed , which is why in the models of Tersoff et al. and Liu et al. , there is simply a maximum of tensile strain above a buried QD. Agreement with experiment is more mixed. The vertical stacking of QDs agrees, for example, with the findings from Xie et al. , who grew InAs quantum dot arrays with GaAs spacers. However, the dots are aligned along the - and -directions rather than in chains along the -direction as in experimental results from Wang et al. [5, 20, 21] for In0.4Ga0.6As QDs. That said, the dot alignment from the simulations is similar to that seen in the growth experiments on Si0.25Ge0.75 QDs discussed by Tersoff et al. [14, 24]. This makes sense in the light of the caveat at the end of the previous section, which noted that the simulation relies on assuming that the energy barrier to diffusion can be characterized by a single mean value, and this assumption is violated where diffusion is strongly anisotropic, as it was in the systems studied by Wang et al. [5, 20, 21]. It should be noted that for InAs and InGaAs, is generally the preferential direction of diffusion [6, 25, 26]. For Si and Ge, the preferential direction of diffusion is along the dimer rows of their 1 × 2 and 2 × 1 surface reconstructions , but for successive monolayers of Si or Ge, this direction (i,e. the direction of the dimer rows) switches from  to and back . If the surface of a Si spacer is rough, then regions of it with dimer rows along  can easily be alongside regions where the dimer rows are along , evening out the effects of diffusional anisotropy. This may explain why our model agrees more with experiments pertaining to Si and Ge than to InGaAs systems. 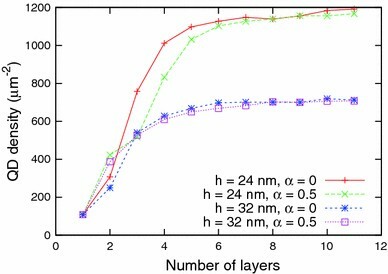 The results from this layer-by-layer growth model are in partial agreement with experimental results but do not fully take diffusional anisotropy into account. This growth model agrees more with results from experiments of growth of SiGe QDs than experiments involving QDs of (In,Ga)As. This work was partially supported by the National Natural Science Foundation of China No. 10772106 (E Pan), the Defense Threat Reduction Agency Joint Science and Technology Office (DTRA-JSTO) under the grant W911NF-06-2-0038 (E. Pan, P. W. Chung, J. J. Ramsey), and the ASEE/SMART Fellowship program (J. J. Ramsey). We are also grateful to Ohio Supercomputer Center for providing us with the required computer resource units under grant #PBS0268-2. We thank the reviewers of this article as well, for their vital input.